There’s a reason we have so many lawyer jokes. Great irony exists when imperfect lawyers litigate imperfect laws. Especially when some lawyers forget that irony. After all, how many of them have more integrity than you or me? And when the most confident of lawyers do fall, it can be that much more tragic. 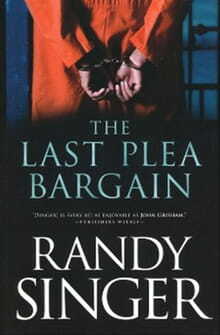 These underlying tensions resemble tectonic plates worthy of an epic earthquake, and author Randy Singer fully exploits them for his latest novel, a legal thriller/mystery titled The Last Plea Bargain. Centered on a principled young Assistant District Attorney in Atlanta who doesn’t do plea bargains, Singer’s superbly researched plot charges out of the starting gate on Page One, and doesn’t rest until literally the last page. In between lies the harrowing saga of our intrepid ADA seeking to reconcile the murder of her mother with final death-row appeals by lawyers for the man accused of killing her. Meanwhile, the flamboyant attorney who initially defended the accused is facing murder charges himself after his trophy wife dies a mysterious death. The DA’s office becomes convinced these two deaths are inextricably linked, but that link is a career criminal nobody can trust. Perhaps this sounds a bit benign for a story, but frankly, it’s hard to estimate how much detail can be revealed without giving away too much of the ending—Singer’s book is chock full of clues and stunning deceit. Suffice it to say that although some semblance of justice does eventually emerge, it’s a dirty justice, and hardly valiant, disappointingly contrary to what we Americans assume is common. Yet it’s a justice Singer himself seems uniquely positioned to unpack for us: you see, in real life, he’s both a practicing attorney and pastor of an evangelical church in Virginia. Which may help explain his book’s length—at 372 pages, it’s not a quick read. But then, how many short-winded lawyers or preachers do you know? Still, it’s a relatively easy read, with some intriguing forensic pathology CSI-lovers will relish. There is one goofy Nashville bar scene, but, lest it linger too long as gratuitous violence, Singer soon reveals its contribution to the plot. And speaking of gratuitous, it’s nice to read a novel like this without the unnecessary sexual perversity within which non-Christian writers of this genre love to wallow. About the only thing many evangelical readers might frown upon involves the opposition to capital punishment expressed by our protagonist’s brother, a pastor. Biblically, of course, we know that God actually prescribes the death penalty, but only when there are two witnesses. The accused in this story doesn’t have those, so here again, what’s right becomes more debatable than we’d like. In fact, as Singer tells it, the debate over capital punishment helps illuminate key shortcomings within our legal system. It’s not so much whether civil authorities have the right to execute murderers, but whether a society’s legal system properly vets the truth. Granted, The Last Plea Bargain is fiction, but how far from reality does it stray? Having imperfect people trying a case against another imperfect person reduces imperfection to varying degrees of goodness. And how often might the people responsible for exacting justice be the ones in greater need of it? Singer’s lesson in The Last Plea Bargain isn’t that all lawyers are scum. But one of his lessons is that not all accused murderers are scum, either. And that God’s grace is lavish no matter what side of the courtroom you’re on. Provided you take His Word as the truth, the whole truth, and nothing but the truth.